The summer season can present unique hazards for those working in the hot weather. 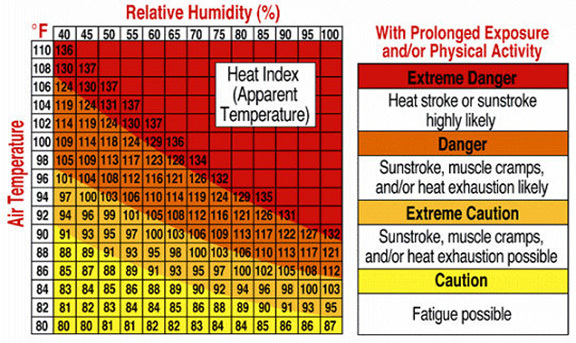 The combination of heat, humidity and physical labor can lead to a variety of heat-related illnesses. Proper protection and simple precautions can often prevent these types of illnesses and save lives. The human body maintains a fairly constant internal temperature. When we become overheated, several reactions take place. First, the body rids itself of excess heat by increasing circulation in the blood vessels close to the surface of your skin. This is why your face and hands turn red when you begin to overheat. Your brain may also signal your sweat glands to work harder. As the sweat evaporates, it cools the skin and removes large quantities of heat from your body. 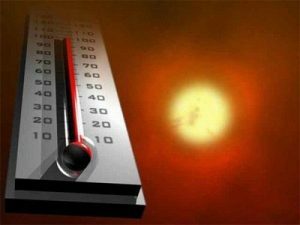 Problems begin when outside temperatures are near your body temperature (98°F/36°C) if the air temperature around you is warmer than your skin, blood that has been brought to the body surface cannot lose its heat. Also, if the humidity is high, your body will continue to sweat liquids containing electrolytes, but will not easily evaporate. Therefore, you can’t rid yourself of the excess heat that is building up. With so much blood being sent to the outer surface of your body, less is available for active muscles, your brain, and other internal organs. The problem is you may not realize this is happening. How can heat related illnesses be prevented? Drink water: A person working in a hot environment loses water and salt through sweat. This loss should be compensated by water intake equal to the fluid loss. Plenty of cool drinking water should be available on the job site and workers should be encouraged to drink water even if they do not feel thirsty. Wear light, loose fitting clothing: Wear light colored, loose-fitting clothing that permits sweat evaporation but stops radiant heat. Tightly woven clothing that you cannot see through is best. Protect yourself from the sun: Use sunscreen with sun protection factor of at least 15 to block 93% of UV rays. Wearing UV-absorbent shades should block 99% of UVA and UVB rays. Also, wear a hat and use screens or umbrellas to create shaded areas. Allow flexibility: Make sure to take regular, frequent breaks and permit less physically demanding activities during peak temperature periods. Rest periods in a cooler area can easily prevent or reduce heat-related illnesses. It’s easy to get caught up in the job and forget about the importance of staying hydrated and taking regular breaks. Heat illnesses can occur quickly, and if the victim isn’t treated, the situation can become life threatening. Watch out for signs of heat illness in yourself and your co-workers, and report any symptoms to your supervisor right away.